Here you will find a list of safety tips relating to lawn mower use, gasoline, electrical equipment, advertising and general safety precautions. Always make sure you have read the operating guide for your lawn mower. The better you understand how to use your lawn mower, the safer you will be. Never run over anything other than grass with your mower. If there is something in the lawn that cannot be removed, such as sprinkler heads or drainage caps then make sure the blade will go over it while the engine is off first. If the blade can’t, then mow around the object. Always use care on inclines. 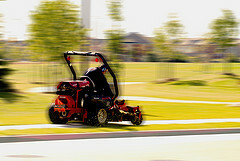 Push walk-behind mowers across slopes and drive riding mowers up and down slopes. If you think a slope is too steep, then don’t mow it without asking your customer. Never let grass or other debris accumulate on top of your mower, especially if it’s dry. If the mower gets too hot, the grass could ignite and start a fire. Never run your lawn mower if you notice that it is leaking. That leak is most likely gas or oil. In either case, it can be harmful not only to you, but the grass you are mowing as well. If you are using a riding mower, never let anyone else ride on the mower with you. They could fall off then you might run them over and cause serious injury/amputation. Never run your lawn mower while you’re on pavement. On the pavement, objects are much more likely to be thrown at very high speeds. Always stay clear of a hot engine after mowing a lawn. Mufflers can reach up to 1200˚ F which is plenty hot enough to burn you. Always make sure your mower is in good working condition. The lawn mower is safest when everything runs properly. Never continue to run your lawn mower if it starts smoking. Smoke from your lawn mower means something is way too hot or on fire. Always keep all four wheels on the ground. Tilting the mower could cause something to unexpectedly fly out from underneath. Never leave a running mower unattended. You never know who or what can get caught up in your mower while you are not there. Always disconnect the spark plug when you work on your mower. This will prevent the engine from accidentally starting. Never leave your gas-powered lawn mower running in an enclosed area. This will cause that area to fill up with toxins that are harmful to breathe. Never empty the grass-catching bag while the engine is running. Not only will the grass fly everywhere and make a mess, a rotating blade increases the chances of cutting off fingers. Always set the wheel height of your mower prior to starting the engine. Making adjustments to your mower should always be done while the blade can’t slice anything off. Always shut off the engine before unclogging the discharge shoot. This is a good way to prevent cutting off your fingers. Never use your mower for something it is not designed to do. For example, don’t use your mower as a form of transportation. Never modify your lawn mower to make the engine more powerful or blade rotate faster. It won’t cut the lawn any better and will only make your lawn mower more dangerous. Never remove a safety feature from your mower. They are there for a reason. Never store gasoline in the house. Gasoline puts off toxic fumes that are harmful to breathe in. Always store your gasoline in a container that is clearly marked G-A-S. This way other people will know what is in there too and they can take their own precautions. Always handle fuel with care by not overfilling the gas tank and wiping up any spills. Never remove the gas cap or add fuel while the engine is running. You should always turn off the engine and let it cool down before refueling. Never fill the tank on a mower that has been operating and is hot. The gasoline can be ignited by a hot muffler. Never use your electrical power equipment in wet conditions. Wet conditions can cause electrocution. Always make sure the power switch is in the OFF position before plugging the device into the outlet. Always unplug the cord directly from the outlet. Unplugging the cord by yanking on it could damage the cord or worse, someone who is nearby. Always make sure your electric cords aren’t damaged or frayed. When wire is exposed, it increases your chances of being electrocuted. Always make sure you know where your cords are so you don’t trip over them. Never wear sandals while mowing lawns. Open-toed shoes cannot protect your foot if it slips into the blade or from other flying objects that the lawn mower might throw. Never wear baggy clothing while mowing lawns. Loose clothing can get caught up in the lawn mower controls and other moving parts. It is generally a good idea to wear long pants while mowing lawns. Long pants will protect your legs from debris that is thrown from the lawn mower. Always wear eye protection while mowing and trimming. It is a lot easier to have a lawn mowing business when you have two eyes. Always wear shoes that have good traction while mowing lawns. Slipping and falling might cause you to lose control of your mower which could result in it running over something it is not supposed to. Never go door-to-door advertising to an unfamiliar house or neighborhood. If you go door-to-door you should at least tell someone else exactly where you are going and how long you plan to be out. Check out the website, www.familywatchdog.us, to see if there are any criminal offenders in your neighborhood. If there are, it is best to avoid their house. Do not put too much personal information on your advertising. All the personal information you really need on your advertisements are your business name, your name, and one or two ways that they can contact you. While going door-to-door, if someone tells you to come in to their home, DON’T unless both you and your parents know them personally. You can say that you are busy and do not have time to come in. Always trust your gut instincts. If you are approaching a house or talking to a potential customer and you get a funny feeling about it, leave. You can say that you are getting a phone call that you have to take if you feel awkward just leaving a house. Always make sure someone knows where you are mowing, whether it’s your parents, the customer, or a friend. If you get injured and can’t move or tell anyone, they will know where to find you. Always check your lawn before you mow. Items such as sticks, rocks, toys, wire, and other objects can shatter and be thrown if they are run over by the lawn mower. Always look for holes in the lawn so you do not step in them and twist your ankle. Always make sure children and pets are not in the lawn while you are mowing. They usually do not understand the dangers associated with lawn mowers. Never mow the lawn when it is dark outside. You need to be able to see where you are mowing so you don’t run over anything. Always wear sunscreen while mowing lawns. Sun is more damaging to your skin than you think. Always drink plenty of water before, during and after mowing lawns. Lawn mowing is a physically demanding activity and your body will not function properly without plenty of water. Never mow wet grass. Wet grass is slippery. You could fall and slip under the mower. Never mow a lawn while it is lightning or thundering. If you can see lightning or hear thunder while you are in the middle of mowing a lawn, abandon your mower and get inside. Your safety should always be your first priority while mowing lawns. If for any reason at all, you feel unsafe, just go home. Then call your customer and let them know what happened. They will understand. Want to make big money mowing lawns?